Is It the First Step or All Those That Follow? Every journey starts with a single step. So, how many of us can remember our first tenuous and unsteady steps as a toddler. OK, no one can. Details from anyone who can recall could be fruitful to our conversation. So, how many of us can remember the first steps on our journey toward academic leadership? What was it? A credential? An appointment? A promotion? A fellowship? A postdoc? The scope of responsibility or authority? Sometimes, perhaps, a family member or professional acquaintance reminds us of something we might have expressed in our youthfulness about our aspirations and our career goals. Whatever it was, it is probable that most of us cannot pinpoint any one thing that initiated our journey toward academic leadership. Wherever we are on that journey, we can note with certainty, innumerable steps, unforeseen, but necessary stumbles and falls, and accomplishments, sometimes, known only to our inner selves. Moreover, as our theme of “Preparing You for the Next Phase of Academic Leadership” suggests, it is a journey that has phases and is not necessarily a destination. In this community in which we now find ourselves, each of us is at a different phase of leadership, and ready or not, is ready to move to the next phase. As in the initial steps as a toddler, there must be preparation. We learned movement, and we perfected control of our balance, learning to pull ourselves up by grabbing and holding on to something. We accepted the mentoring hand reaching to steady us when we wavered in our initial attempts to steady ourselves. As we acquired proficiency and confidence, we became bolder in our steps and maybe we became more methodical planning where we chose to take the next step. Over the past few years, I have had the privilege of being an AABHE Leadership and Mentoring Institute faculty. My session has focused on the Administrative Portfolio as a viable tool for assessing one’s preparation and experiences for the next phase of academic leadership. I often used perspectives from my more than 48 years of personal and professional experiences in academic leadership positions to illustrate the valuable tools and resources one needs throughout the many phases of what is a very challenging journey toward academic leadership. 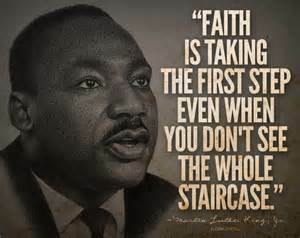 I’m hopeful that I have demonstrated that all things can be possible by taking one step at a time. Thus, consider these three points about academic leadership. First, it is an evolving experience with many roles and dimensions: high, low, and in between. We can readily read the myriad scholarship about the many aspects and levels of academic leadership. However, the Thirty Second Rule, as I came to learn, allows for those few precious moments of pride, excitement, and exhilaration about one’s own accomplishments and success,–or those accomplishments of others with whom we work–before being swept again into the vagaries of this journey. With each step and each experience, we must be ever mindful of both the context and the content of what we experience. We must store both in our toolkit for future reference. Second, as we grow, learning (hopefully) from the good and bad experiences on the journey, it is essential to have moments of reflection on the professional, personal, and spiritual experience, and make them a part of our experience. We should not be so caught up in the accomplishments, successes, or reaching a particular goal that we ignore this critical element. It is in moments of reflection that we pause to consider self, relationships, our values and views of the world, and shortcomings. That, for many practical purposes, is what will allow us to reach more fully those important milestones. Finally, while all paths require a common set of knowledge, skills, and abilities, those leading to the main road of ascendancy to the highest levels of academic leadership require not only a common set but also the development of the broadest level of sophistication and acumen. Purely academic knowledge of the organizational divisions/structures of an institution can enable short-lived advancement. Coupling that with increasing levels of authority and responsibility, we can also move further along the journey. However, it is the increasingly sophisticated political experience and savvy along with academic knowledge, authority, and responsibility that can provide meaningful success in academic leadership. Of course, it does not hurt to have ardent assistance along the way. The journey toward academic leadership requires us to take the first step by choosing a path. In so doing, we must have a toolkit that expands because of our growingly complex experiences along the way. Such that, our toolkit for the journey might initially include only preparation, as in credentials, initial appointments and subsequent promotions, fellowships, conferences, seminars, publications, and so on. As we travel these paths to the main road, we must add balance which must include mentoring, dealing with adversity, understanding intersectionality, and perseverance to mention a few of the other tools needed. These are not– by any means–all of the tools we need, but rather a few of the basic ones necessary to move through the many phases of the journey toward academic leadership. John T. Wolfe, Jr., Ph.D. is currently Associate Vice Chancellor for Academic Leadership Development and Diversity for the University System of Maryland. 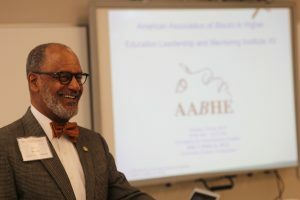 He has served as Provost and Vice President for Academic Affairs at Bowie State University and as President of Kentucky State University and Savannah State University. Dr. Wolfe holds a B.Ed. in English-Education from Chicago Teachers College, an M.S. in English-Education, and a Ph.D. in linguistics from Purdue University.